The Banner Elk NC Ski Resorts are the perfect places to enjoy great activities like Banner Elk Snow Tubing and Banner Elk North Carolina Skiing. With inches upon inches of Banner Elk Snowfall each year, innumerable Things to Do in Banner Elk NC, and enough Vacation Rentals Banner Elk NC to comfortably accommodate the thousands who flock to the scenic Blue Ridge Mountains to spend their winters on the NC Ski Slopes, the Banner Elk NC Ski Resorts are some of the best in the Southeast. At Sugar Mountain Ski Resort, you’ll experience some of the best Banner Elk Skiing conditions the area has to offer. With 20 slopes and 115 acres of skiable terrain to enjoy, a Banner Elk Vacation to Sugar Mountain NC is bound to be fun-filled and unforgettable. If you don’t know how to ski and have always wanted to learn, there’s no better place to go than Sugar Mountain Ski Resort. Whether you’re 5 years old or 95, Sugar Ski Resort has lessons for you. With group, private, and kids’ lessons and midweek specials, Sugar Ski Resort is the place to go to learn the art of Banner Elk Skiing. The Ski School at Sugar Mountain NC is a member of the Professional Ski Instructors of America (PSIA) and the American Association of Snowboard Instructors (AASI). They use the American Teaching System, and provide lessons for all of those who want to learn to ski or improve their skills. Offered from 9 AM to 2 PM and at 6 PM and 7 PM every day (depending on instructor availability), the lessons provided by Sugar Mountain Ski Area are taught by qualified instructors who have a passion of the sports and are committed to providing the best training possible. 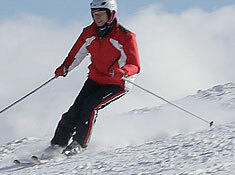 The Sugar Bear Ski School and the Polar Bear Snowboard School are ideal for the youngest skiers and boarders. Children ages 5 to 10 are eligible for instruction in the Sugar Bear Ski School, while kids ages 7 to 14 will love learning to snowboard at the Polar Bear Snowboard School. When enrolled in either of these programs, children will learn all the basics of skiing and snowboarding so that they will be able to make the most of their time on the NC Ski Slopes at Sugar Mountain Ski Resort. Half-day sessions run from 1:00 PM to 3:00 PM and include slope ticket, Banner Elk NC Ski Rentals, lessons, and supervision. The full-day program, which runs from 10:00 AM to 3:00 PM and costs slightly more, includes all of this and lunch. Children will love the fun group setting, as well as the confidence they gain from learning a new skill and making new friends. Parents will love the Sugar Bear Ski School and Polar Bear Snowboard School because it gives them the opportunity to Ski Sugar Mountain without the added responsibility of looking out for their children’s safety. Enroll you children in either the Sugar Bear Ski School or the Polar Bear Snowboard School and enjoy a win-win situation! Sugar Ski Resort provides group and private lessons to children and adults, whether they are beginners or more experienced skiers or snowboarders looking to improve their skills. Group lessons are available to those ages 8 and up. Group lessons that consist of 3 or fewer students will generally last for 1 hour, while those with 4 or more students tend to be about 1 and ½ hour in length. Group lessons cost $20, and are a wonderful way to meet new people and learn new skills. However, if you crave one-on-one attention from a certified instructor, private lessons are probably a better option. Private lessons are available to those 5 years old and up for a cost $48 for a one-hour-long lesson, and are tailored the individual needs of the student. Sugar Mountain NC also offers Midweek Learn to Ski/Snowboard Specials, which include lift tickets, ski or snowboard rentals, and lessons. Twilight sessions and full-day sessions are available to those 8 and up; it costs $58 for midweek ski lessons and $72 for midweek snowboarding lessons. Not only does Sugar Mountain Ski Resort offer fantastic lessons but, toward the end of the season, March Madness rates will begin kicking in. Starting March 8, 2010, all of these fantastic lessons will be available at just a fraction of the cost. If you’ve always dreamt of learning to ski or snowboard, take a Banner Elk Vacation to Sugar Mountain Ski Resort this winter. With lessons for every age group and level of ability and caring, knowledgeable instructors, learning to ski or snowboard has never been easier or more fun. While you’re enjoying you stay at Sugar Ski Resort, don’t forget to check out Sugar Mountain NC’s guided snowshoe tours or miss your chance to show off your skills in one of the NASTAR races that are held weekly (weather permitting) at Sugar Ski Resort. At SkiSoutheast.com, we have all the information you need to play your next visit to the Sugar Mountain Ski Area. Looking for a Cabin Rental Banner Elk? Our advertisers’ listings are full of Vacation Rentals Banner Elk NC and prime Banner Elk Real Estate. We stay up-to-date with the weather so that we can provide you with the latest Banner Elk Weather Forecast and let you know how much Banner Elk Snowfall is on the ground. Trying to plan your itinerary? Let our Trip Planner show you all of the fun Things to Do in Banner Elk NC. SkiSoutheast.com is your one-stop source for all of the Sugar Mountain Ski Resort information you’ve been looking for. We specialize in providing you with the latest information not only for the Banner Elk NC Ski Resorts, but also for Wisp Resort in Maryland, Cloudmont in Alabama, all of the Virginia Ski Slopes, the Best Ski Resorts in West Virginia, and Ober Gatlinburg in Tennessee. Visit SkiSoutheast.com and let us help you plan you next ski vacation!